Size: 1289 sq.ft. - 1830 sq.ft. Siddhachal Elite is a Development by Kalpataru Developer. 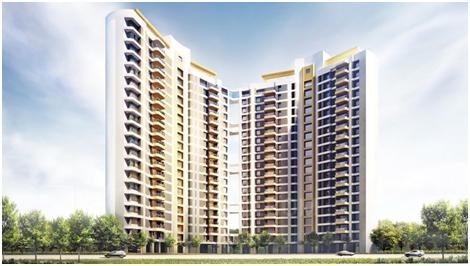 This residential development is designed to offer large accommodation space with the size of 3 BHK to 4.5 BHK units.Siddhachal Elite is built with contemporary design includes well oriented towers to maximize view, light & ventilation.It is ready to move in project @ the starting rate of 2.45 Crore. * 3 BHK flat that consists of 3 Bedrooms, 3 Bathrooms, a kitchen &a living room at saleable area of 1994 sqft. * 3.5 BHK apartments consists of 3 Bedrooms, 3 Bathrooms, a servant room, a kitchen & a living room with saleable area of 2049 sqft. * 4.5 BHK Apartment holds 4 Bedrooms, 4 bathrooms, a servant room, a kitchen and a living room in saleable area of 2646 sq.ft. The price of 4.5 BHK homes starts from 3.29 Crores. Kalpataru Group was established in 1969 by Mr.MofatrajP.Munot. One of the leading real estate development groups in India, Kalpataru Group holds 27 years of experience in development of premium commercial, retail, integrated townships, residential, lifestyle gated communities in Mumbai Metropolitan Region (MMR) & Pune. It has developed 80+ landmarks till date. The Group is also undertaking projects in other key cities such as Jaipur, Surat and Hyderabad. The groupis known for their modern designs and timely construction.Kalpataru Group has completed/delivered various successful projects including residential properties, commercial, religious establishments and other projects. * 5 minute drive from the Eastern Express Highway. * 45 minute drive to the domestic airport and major business districts like BKC and Powaiapproximately. As the homes of Siddhachal Community are flooded by very famous landmarks to provide fresh breeze to rejuvenate your mood. It is alsoin close proximity toTikuji-Ni-Wadi and Sanjay Gandhi National Park. Other social infrastructure such as Hospitals, Parks, Schools are in close proximity through road and rail network. Kalpataru Siddhachal Elite is located in Pokhran Road No. 1, Thane West, Mumbai. Elite Homes are being handed over with ample of amenities :- well-equipped gymnasium, rainwater harvesting system, playing zone for kids, swimming pool, indoor game facilities, club house, sauna, CCTV surveillance systems, spa with steam, Jacuzzi and massage room, power backup facilities, party lounge, tennis court and sewage water recycling plant, two enormous Clubhouses, a Gym, a Spa & Jacuzzi, Rooftop fitness center, Recreational center, Swimming and toddlers’ pool, lush Landscape garden with the property aimed for green building LEED certification. Schools - Little Flower School, VasantVihar High School, AnmolVidyaMandir, Municipal School. Bank/ATM(s) – HDFC Bank ATM, ICICI Bank ATM, Axis Bank ATM, Standard Chartered Bank. Hospitals – Prachi Hospital, Bethany Hospital, Trupti Maternity General Hospital, Hiranandani Hospital, Titan Hospital. Shopping Malls –Korum Mall, Lake City Mall, R-Mall, Wonder Mall, Chestnut Plaza, Viviana Mall. Cinemas – INOX, Cinepolis, Pratap Cinema & Tower, Cine City Mulhi Theatre. Railway Stations – Thane Rail station, Mulund Rail Station, Kalwa Rail Station.